Registration for our 2018 Conference is closing soon! 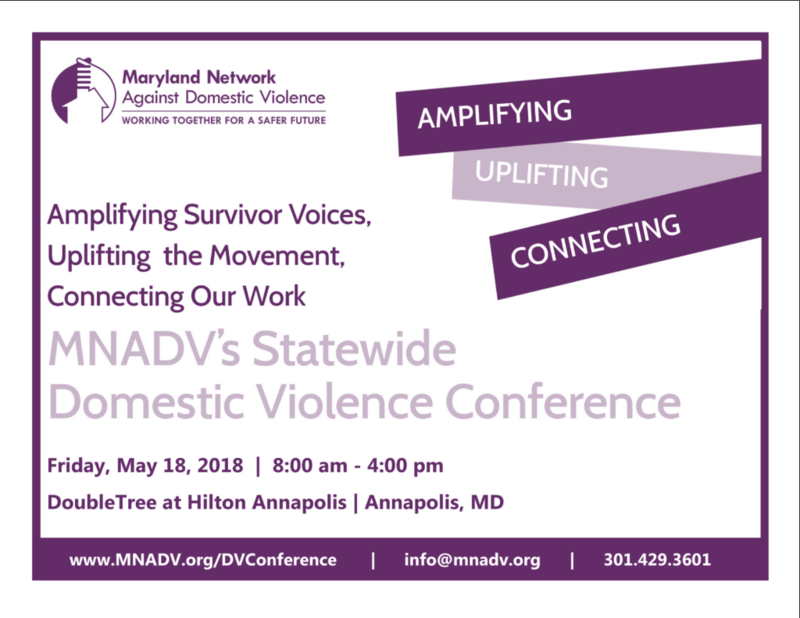 This conference invites domestic violence service providers, law enforcement, and allied professionals to learn, network, and develop new tools to take back to their work. 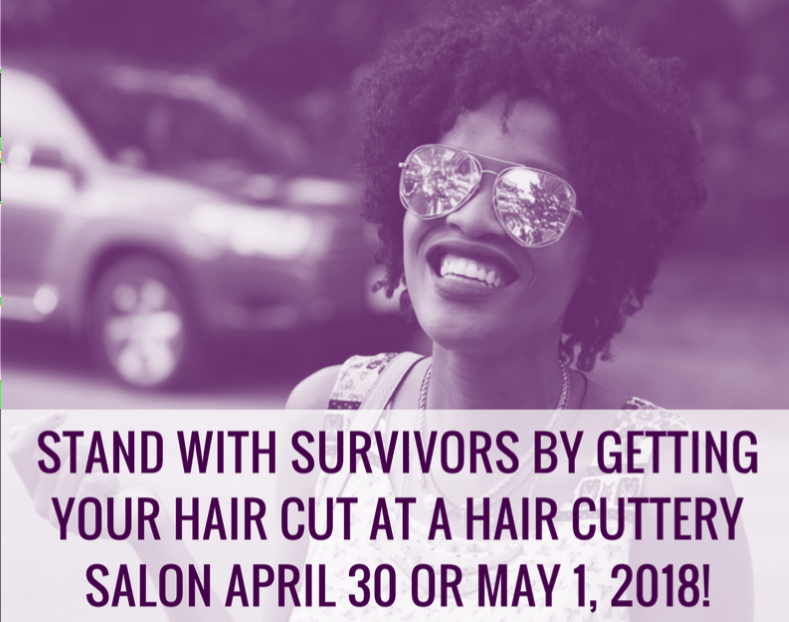 Free Haircuts for Survivors through Share-A-Haircut! For each Hair Cuttery haircut purchased in Maryland on Monday, April 30 and Tuesday, May 1, one FREE haircut certificate will be mailed directly to specific local programs to provide haircuts for domestic violence victims and their children. In 2017, Hair Cuttery donated more than 81,000 free haircut certificates to survivors across the country. There are dozens of Hair Cuttery locations in Maryland. Find one near you. We’re in search of free spaces to hold trainings! Does your organization or business have rooms that MNADV could use for trainings? At MNADV, we host more than 100 trainings per year for more than 1,500 service providers, law enforcement, health practitioners, and allied professionals on how to serve domestic violence survivors. If you have a training space in mind that you’d be interested in letting MNADV use for a training, please reach out to Amber Guthrie. Thank you! We join more than 300 organizations across the country in renewing our commitment to the transgender community and to transgender survivors of violence. When the Housing and Urban Development (HUD) Secretary Ben Carson was questioned about the removal of training materials used to ensure access to housing services for transgender people, Carson invoked a too often used myth – that allowing transgender women access to shelters would “impede the rights of one for the sake of the other”- while also using words like “uncomfortable,” “anatomy,” and “complex.” For those in the domestic and sexual violence field, the phrasing was clear code for justifying discrimination and even violence against transgender women by utilizing the myth that allowing transgender people to access shelters consistent with their gender identity places other residents in danger. This same language is currently being used in states around the country to push discriminatory legislation that would place transgender communities at higher risk of experiencing violence. Transgender people experience unconscionably high rates of sexual assault and domestic violence—and forcing them out of facilities consistent with the gender they live every day makes them further vulnerable to assault. As advocates committed to ending sexual assault and domestic violence of every kind, we will never support any discriminatory housing law or policy and will stand against any statements that could put anyone at greater risk for assault or harassment. You can sign your organization on to this consensus statement as well! After Verizon HopeLine Program Ends, What Are Survivors’ Options for Free Phones? When I learned of the recent school shooting in my state of Maryland, I finally had the hard #MeToo conversation I had been avoiding with my 14-year-old daughter. Why? Because the shooting was not only about school violence; it was also about sexual control and aggression by a 17-year-old boy who shot and killed his 16-year-old ex-girlfriend. The Nonprofit Sector has a long history of exploiting the stories of the people they serve, particularly, people of color which perpetuates racism and oppression. Here are some guidelines and things to consider when writing or sharing the stories of the people we serve. Findings from the Bureau of Justice Statistics’s National Crime Victimization Survey (NCVS), show that from 2004-2015, the US experience 250,000 hate crimes per year. More than half (54 percent) of violent hate crime victimizations were not reported to police. Each month on average, 50 women are shot to death by current or ex-partners, and black women are disproportionately represented in that number. It is possible to respect the activists from Parkland and talk about the double standards wrought by the deeply embedded racism in this country. We will not end violence against women or gun violence unless we talk about exactly that. Chances are someone you know is a survivor of sexual violence. They might not have told you, or anyone else, out of fear of being blamed or judged. With the #MeToo movement making it more acceptable for victims to openly discuss their experiences and the added layer of April being Sexual Assault Awareness Month, it is possible that a loved one might share their story with you for the first time. The Violence Against Women Act (VAWA) is central to our nation’s effort to fight the epidemic of domestic, sexual, and dating violence, and stalking. We are now at a critical moment when zero tolerance for domestic violence, sexual assault and sexual harassment must be the norm. The #MeToo movement has shown us the courage and strength of victims to step out of the shadows and hold their abusers accountable. Congress must continue sending the clear message that violence against women is unacceptable and stand with these courageous survivors when they come forward seeking help. More than 84% of Native women experience violence in their lifetimes, but reports of missing and murdered Native women don’t garner the same attention and response as those of white women. However, in states across the country, lawmakers are giving the issue more attention in recent months. This bench book is instrumental in assisting judges hearing cases in issuing SIJS findings in a wide range of state court cases involving immigrant children who have been abused, abandoned or neglected by a parent. The bench book contains quick reference guides for courts issuing SIJS findings in custody, protection order, guardianship, dependency, delinquency, adoption, and declaratory judgement cases. These briefs are results of research on how to better understand how select indicators associated with substance use relate to changing trends in child welfare caseloads. The results describe how the child welfare system interacts with community partners to serve an increasing population of parents whose substance use has impaired their ability to parent their children. This report shares themes and issues from the “From Margins to Center Listening Sessions” conversations to aid in self-reflection, challenge dominant narratives, support improved data collection and analysis, and to begin, continue, or advance conversations and work toward racial equity for domestic and sexual violence survivors and for all of us. In just August of 2017, NCAVP had recorded the highest number of anti-LGBTQ homicides in their 20-year history of tracking this information, and decided to release a mid-year report to raise awareness of this striking increase. Since the release of the Crisis of Hate report in August of 2017, the number of reported homicides continued to increase, reaching a total of 52 reported anti-LGBTQ homicides in all of 2017. This report provides a comprehensive look at all 52 of the hate violence, anti-LGBTQ homicides NCAVP reported in 2017. The Center for Court Innovation is excited to announce the 2018 Community Court Grant Program. Community courts seek to improve neighborhood safety and engage residents in solving local problems. Researchers have documented that community courts help to reduce recidivism and the use of jail while improving public trust in justice. Since the launch of the first community court in Midtown, Manhattan, the model has expanded to new jurisdictions, new settings (including libraries), and new populations (including veterans). Assistance is available in three categories: (1) funding and technical assistance to create or enhance a community court; (2) funding and technical assistance for an impact evaluation of an established community court; and (3) recognition of, and technical assistance to, community courts that wish to serve as mentors to the field. IAM TYE..Better me, Better You!